ABC 7’s Chief Meteorologist Bob Harrigan has been forecasting Suncoast weather for 33 years. You can watch Bob’s forecasts weekdays at 5 pm, 5:30 pm, 6 pm, 7pm, and 11 pm. Bob graduated from the University of Kansas with a degree in Atmospheric science. Before coming to Sarasota in 1985, Bob worked for the National Weather Service as a weather observer, and as an instructor in weather forecasting and micro-computer classes at the University of Kansas. Bob has a unique perspective on Hurricanes. He was able to experience the power of these storms close up. In 1996 he flew into the eye of a 115 mph hurricane named Bertha aboard the famed Hurricane hunter aircraft. In 2004 he boarded NOAA’s hurricane hunter aircraft, the P3 Orion, and flew into an even stronger storm named Ivan. Strong storm systems can pop-up quickly here on the Suncoast, and Bob always makes sure viewers are armed with knowledge to help them get through severe weather when it threatens our area. 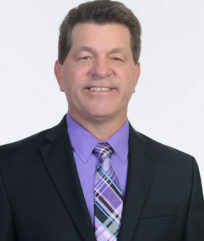 Bob has been voted by the Bradenton Herald readers as the “Best Television Meteorologist” in the Tampa bay area over 5 times. He has also been voted the “Best Television Personality” by Sarasota Magazine many times and recently 3 in a row from 2014 through 2017. Besides weather Bob enjoys playing golf and fishing. In fact you can catch his fishing segment “Fishin’ with Bob and Capt. Jonnie” on Thursdays at 11 p.m. and again on Friday’s 5:30 newscast. Bob has been designated a Certified Broadcast Meteorologist by the American Meteorological Society. Bob resides in Bradenton with his wife Susan and daughter Emma Grace. Follow Bob on his Facebook page and his “Fishin’ with Bob and Capt. Jonnie” Show.